On Christmas Eve, South Korean game developer NCSoft received a lawsuit in its stocking from a Massachusetts firm that claims to hold an extremely broad patent for developing online virtual worlds. 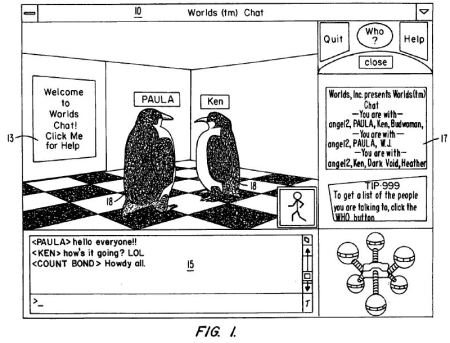 The legal complaint from Worlds.com alleges NCsoft infringed on its patent for a "system and method for enabling users to interact in a virtual space." The lawsuit fingers nearly all of NCsoft's catalog of massive multiplayer games sold in the US, including City of Heroes , Guild Wars , Tabula Rasa , Lineage , and Lineage II . Worlds.com's lawsuit seeks a permanent injunction on NCsoft's supposedly infringing MMO wares, an unspecified amount of damages along with prejudgment and postjudgement interest, or "in no event less than a reasonable royalty." A client computer program provides instructions for a processor to locate and retrieve rich media and HTML files over a network, such as the internet, an internet or an LAN, for running in a three-dimensional (3D) graphical user interface. The program provides instructions for the processor to generate a 3D graphical user interface on a display. Then, the processor generates a metaphorical user object for navigating and interacting in the three dimensions within the environment via navigational and interactional inputs, respectively, from a user. The processor also integrates an HTML object into the environment, and interacts the user object with the HTML object in response to an interactional input from the user. Which should sound familiar to anyone who's ever played an MMO game - or nearly any 3-D online application. The patent was filed in August 16, 1999 and granted to Worlds.com on May 4, 2004. (Note that City of Heroes was released April 2004, before the patent was issued. Lineage was released in 1998, before the patent was even filed. 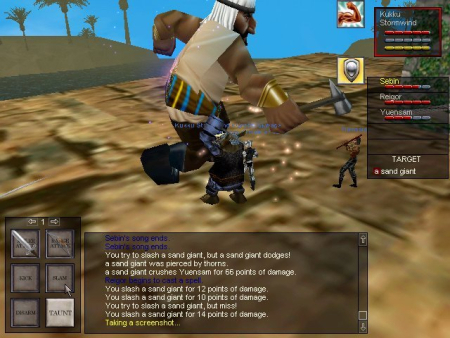 For example, the user interface of Everquest – a MMO released March 1999 – shares more than a few design traits in common with World.com's patent. Earlier this month, Worlds.com hired the IP enforcement firm General Patent Corperation (GPC) to enforce its patents. The company indicated Worlds.com may be planning an industry-wide shakedown on its MMO patents. "The Worlds patents represent exceptionally valuable intellectual property," said GPC chief Alexander Poltorak as part of the announcement. "We welcome licensing inquiries from the on-line game industry. Non-exclusive licenses are available on favorable and non-discriminatory terms."